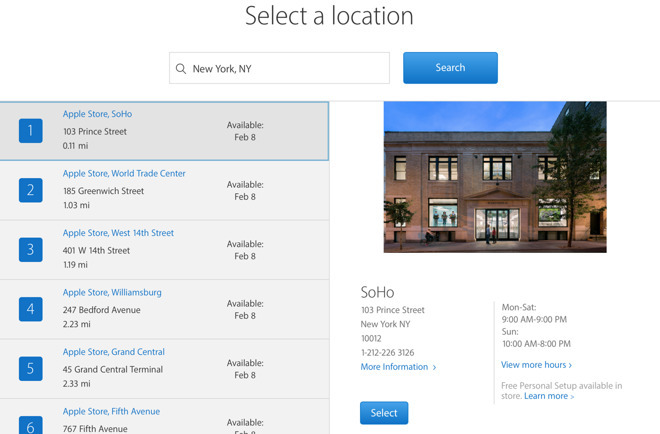 The new in-store pickup option on Apple's online store shows that the first orders will be available on Feb. 8. For customers who choose shipping to their home, the earbuds are estimated to arrive in six weeks. Of course, it's possible that Apple simply chose overly conservative estimates for availability. The AirPods were delayed by two months from their original October launch for undisclosed reasons, and only this week began shipping to customers, just days before Christmas. Apple began fulfilling the first online orders on Monday, and limited inventory was also available at the company's retail store, though initial stock sold out quickly. AppleInsider went hands-on with the $159 wireless headphones last week and came away impressed with their advanced technology and ease of use. The earbuds include an Apple-designed W1 chip for easy pairing and Bluetooth connectivity, as well as beam-forming microphones, accelerometers, and a small charging and carrying case. The fully wireless headphones come with a one-year warranty that covers audio defects and battery problems. Outside of that period, standard repairs are $69, battery service is $49, and replacement buds in the event of one being lost will cost $69 each.